Last week we gave you a sneak peak of a project we are working on. For months now, I've wanted to do something with the alphabet in the nursery and I have been finding inspiration pictures like these. The real issue that I was running across with all the ideas I came up with for this project was price and effort. 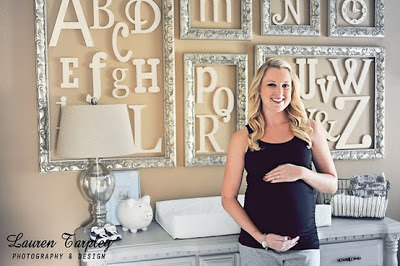 Wooden or MDF letters from the craft store are pricey especially when you want large letters and then I would have to paint them all and hang them all so this option was both expensive and time consuming (especially if you include frames). 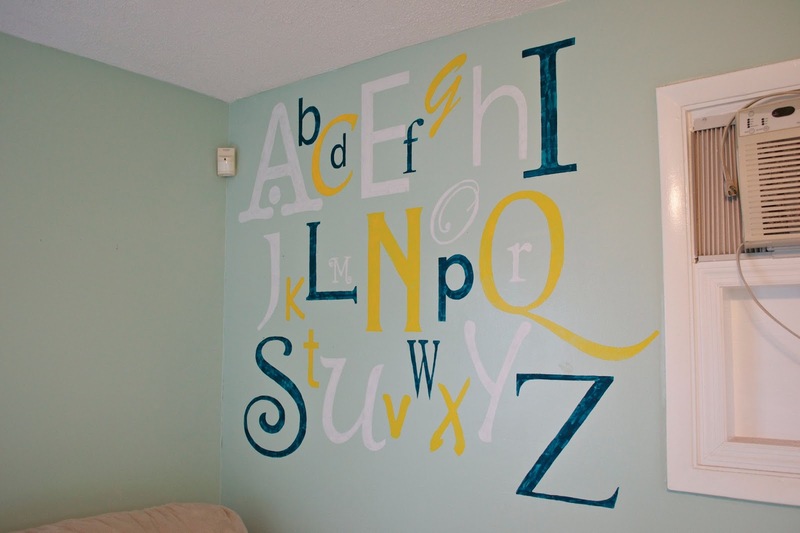 The other idea was to get stencils and using those to paint the letters on the wall. Finding stencils for large letters is really hard and extremely pricey when you want different fonts and sizes. So after many months of debating what I wanted to do and seeing if any sales would bring the price down to a reasonable level, an idea pop into my head that would allow me to do the entire project for free. Since free is my favorite price, I decided to give it a try since if it didn't work or I didn't like it I could just paint over it. 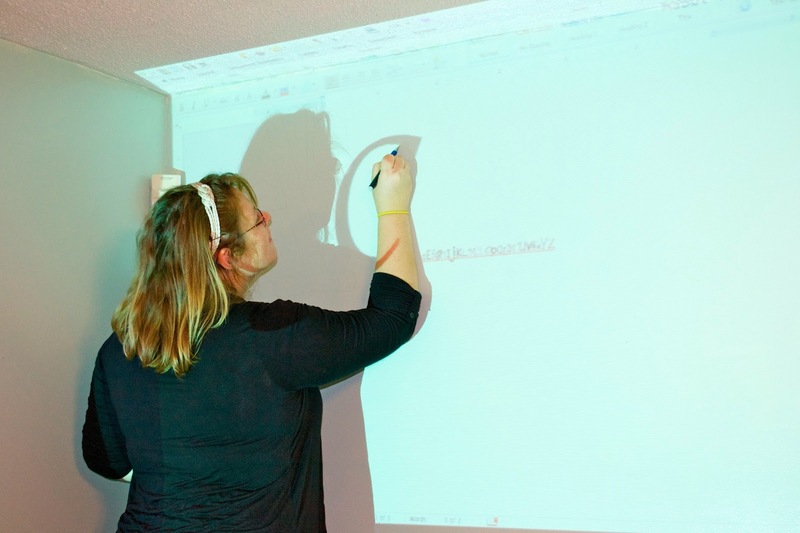 This project required a borrowed projector, Windows Word, a pencil and leftover paint from other projects. Technically speaking, I spent $1.50 on a pack of inexpensive small paintbrushes so it wasn't totally free but it sure beat the few hundred dollars I was looking at for the other methods. Before I started, I went through on Word and picked out a bunch of different fonts for the letters. Then I set up the projector and got to work. There isn't any real rhyme or reason for how I set up the letters, I just played around with size and position until I liked how things looked. This required some thinking ahead for the rest of the letters but it was fun to play around with it. Once I liked the position, I simply used a pencil to trace around the letter. It took a few hours to trace out the whole alphabet but it didn't feel like it took that long and was actually relaxing. Once all the letters were traced out, I channeled my inner first grader to simply paint within the lines. It's important to use pencil for the lines since pen does not get covered up well especially with light paint. Once again, I just painted the letters the different colors based on what looked good. I mainly just didn't want a bunch of the same color in the same area. We aren't completely finished with this project yet since we had to take a break for the carpet to be installed but we really like how the wall is coming together. We are also doing something on the other side of the wall and what I love about the projector way of doing this is that anything you can find to project can be put on the wall so you have so much flexibility. Now we are lucky in that we can borrow a projector for free and we already had paint that went with this room but even if you aren't in this boat, most public libraries let you rent/borrow projectors and you can buy paint samples for a couple of bucks so anybody could do this project for about $10. this is flippin' awesome! free is for me, too, and this is so much easier to change out one day. fabulous job! This is so cute and I love the colors that you used! I love this! What a fun idea. It turned out great! Pretty solution - I love this idea best because it doesn't limit the ways you can put the furniture in the room. Nice font, too! You're wall looks awesome! I've always wanted to try the projector as a wall stencil technique! Thanks for the inspiration and for linking up to Monday Funday! LOVE this!!! What a fantastic idea! Thanks for the inspiration! That's so cute!! My sisterinlaw is actually doing the same thing for my niece's nursery, but she is using wood letters instead of painting them like you did. I actually decorated a letter for it for the pinterest challenge!